EC-BNT SE3180 Alouette II Astazou, Avicopter MSN 2001. Stanley BAKER, Alex CORD, Honor BLACKMAN, Richard ATTENBOROUGH, Rafer JOHNSON, Andrew KEIR, etc. Beginning in the Congo, a group of mercenaries led by British Major Harry Grigsby (Stanley Baker) are due to be picked up by helicopters after completing a mission. As they board the choppers they are fired on from the helicopters by another group of mercenaries led by American Kip Thompson (Alex Cord) who has been hired to change sides. Recovering in the United Kingdom, Grigsby is recruited by HM Government to take out Thompson who has been hired by Red China to stir up trouble in the New Territories between Hong Kong and Red China. As neither nation wants open warfare with each other, each side hires expendable mercenaries. Grigsby recruits his surviving old crew including Rafer Johnson, John Thaw, Andrew Keir, and Julian Glover. In addition to fighting Thompson, Grigsby finds time to seduce the wife (Honor Blackman) of his liaison, a British General (Richard Attenborough) (source : Wikipedia). 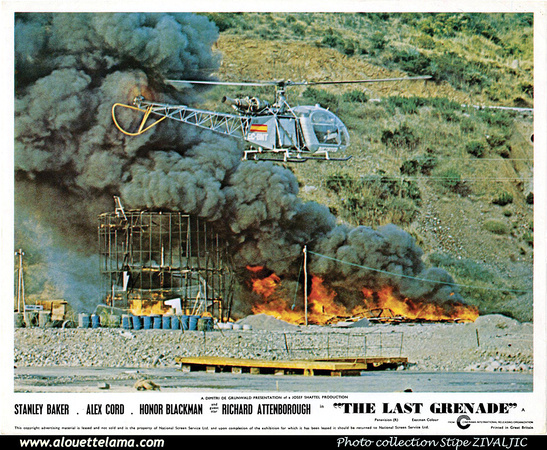 Affiche du film "The Last Grenade" montrant l'Alouette II EC-BNT (SE3180 MSN 2001) d'Avicopter au-dessus d'une scène d'action - Collection Stipe Zivaljic.